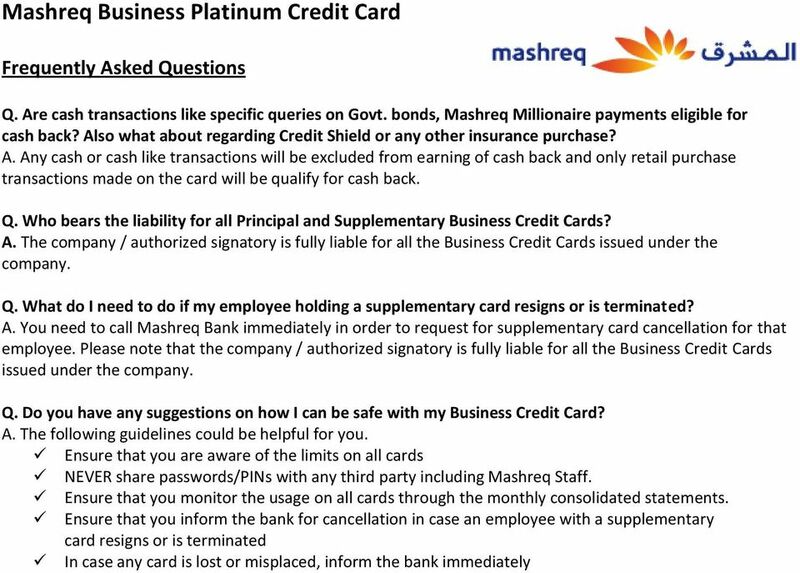 Download "Mashreq Business Platinum Credit Card"
2 Q. What are the other benefits/ features associated with Mashreq Platinum Business Credit Card? A. You will enjoy: Exclusive travel offers including but not limited to travel related discounts, complimentary travel insurance, unlimited access to Airport Lounges at major International Airports across the Middle East. Exclusive discount of up to 50% across a range of categories related to business spends; Hotel accommodation, Business services, Rent-a-Car, Automotive services, Concierge services and many more Dining discounts of up to 50% at over 1800 restaurants across UAE and restaurants across India, Oman & Qatar. For further details, please visit Mashreq.com/flavors Cash advance facility up to a pre-assigned percentage of your available credit limit UAE s largest 0% EPP for purchases made at over 1000 outlets across UAE. For further details, please visit Mashreq.com/easypay Utility Bill Payment, and Free Online and Phone Banking. Avail balance transfer & Easy Cash facilities at competitive rates. Q. Which are the airports that offer the complimentary lounge access facility? A. Complimentary Airport Lounge access can be availed at the following International Airports: UAE Dubai International Airport. Marhaba Lounges (Terminal 1 ) Jordan Amman International Airport. Crown Lounge Egypt Cairo International Airport. VIP Lounges (Terminal 1 and 3) Kuwait Kuwait International Airport (Pearl Lounge) Saudi Arabia Dammam International Airport, First Class Lounge (Foreign Airlines) Jeddah International Airport, First Class Lounge (Foreign Airline - North Terminal) Riyadh International Airport, 'Premier Lounge' in Terminal 1 (Foreign Airlines) For detailed terms & conditions, please click here Q. Can we give Supplementary credit cards to our partners and employees? A. Yes, the supplementary credit cards can be issued to the partners/employees upon request from the Authorized Signatory on behalf of the Company. In fact, the Company can request for as many as 99 Supplementary credit cards. Q. Will the Supplementary card members have access to activate and block their cards through DBC? A. No, the Supplementary credit card members will NOT have access to activate and block their respective credit cards through DBC. Any request for activation or blocking of a supplementary account can only be initiated by the Authorized Signatory. The same applies for all service related requests. Q. Who will receive the SMS for any transaction carried out on the Business Card(s)? A. Transaction SMSes will be sent to individual card members. Q. 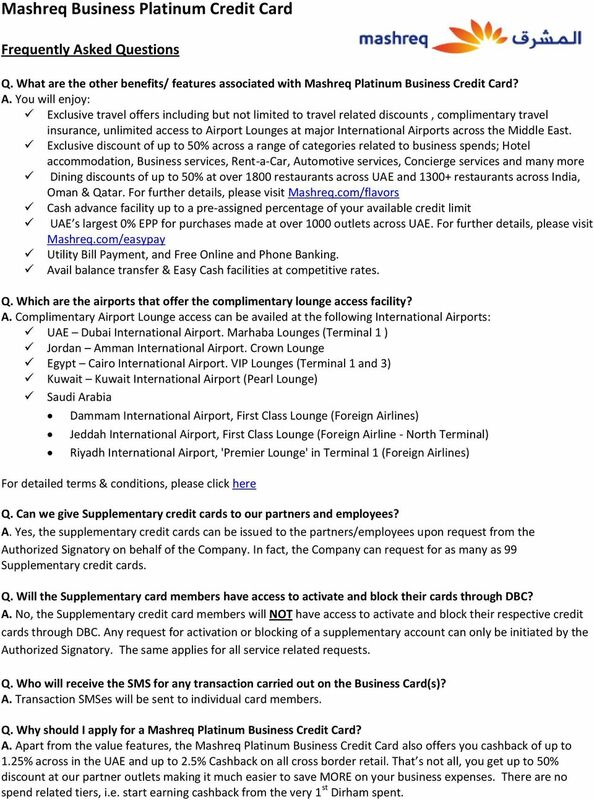 Why should I apply for a Mashreq Platinum Business Credit Card? A. Apart from the value features, the Mashreq Platinum Business Credit Card also offers you cashback of up to 1.25% across in the UAE and up to 2.5% Cashback on all cross border retail. That s not all, you get up to 50% discount at our partner outlets making it much easier to save MORE on your business expenses. There are no spend related tiers, i.e. start earning cashback from the very 1 st Dirham spent. 3 Q. What is so special about the Mashreq Platinum Business Credit Card? A. The Mashreq Platinum Business Credit Card is a Free for Life Credit Card with unique cash back offering. Because there are no minimum spend thresholds, the Mashreq Platinum Business Credit Card allows you to earn Cashback from your first spend. In addition, the cash back is not limited to select categories of purchases or merchant outlets. So you can earn cash back across all your business spends. Moreover your business can earn cash back of up to AED 1000 per month. Q. Are there any caps applicable on cashback earnings? A. Your Company will earn cash back a maximum cashback of AED 1000/- per month on the purchases made on the Mashreq Platinum Business Credit Card. Q. Will we earn Cashback on all utility expenses? A. If the Utility Bill Payment is made through external channels then the Cashback will be accrued. However if the Utility Bill Payment is done using any Mashreq channel like Mashreq Online, Mashreq Branches etc then the Cashback will not be accrued. Q. Will we have to shop at certain outlets or categories of outlets to earn the Cashback? A. The Mashreq Platinum Business Credit Card allows you to save more on your business spends. This means that you can earn Cashback on just about any purchase like dining, office furnishing, electronics, travel or any other made on your Card (s); excluding utility expenses through Mashreq Channels. The Card member(s) will earn Cashback on all qualified transactions. Q. 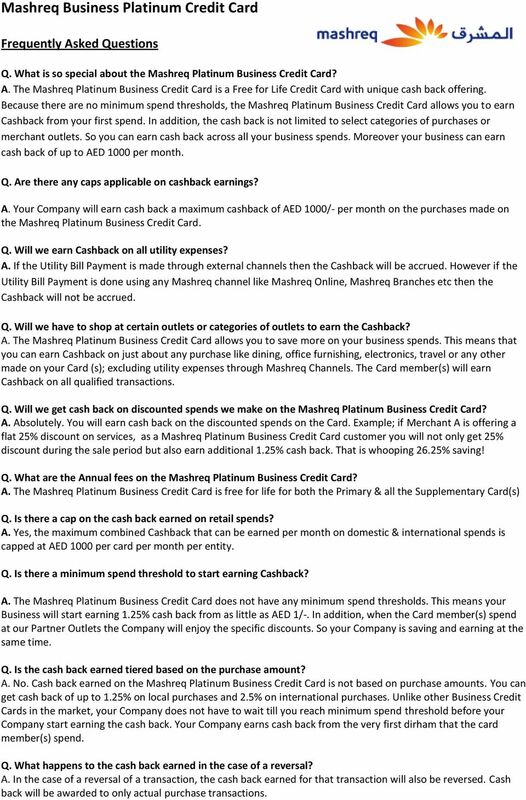 Will we get cash back on discounted spends we make on the Mashreq Platinum Business Credit Card? A. Absolutely. You will earn cash back on the discounted spends on the Card. Example; if Merchant A is offering a flat 25% discount on services, as a Mashreq Platinum Business Credit Card customer you will not only get 25% discount during the sale period but also earn additional 1.25% cash back. That is whooping 26.25% saving! Q. 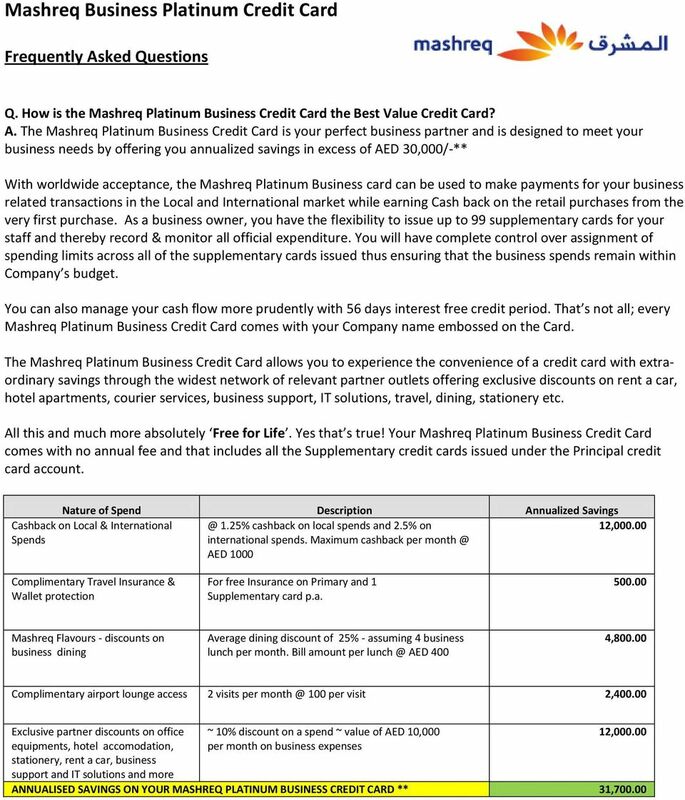 What are the Annual fees on the Mashreq Platinum Business Credit Card? A. The Mashreq Platinum Business Credit Card is free for life for both the Primary & all the Supplementary Card(s) Q. Is there a cap on the cash back earned on retail spends? A. Yes, the maximum combined Cashback that can be earned per month on domestic & international spends is capped at AED 1000 per card per month per entity. Q. Is there a minimum spend threshold to start earning Cashback? A. The Mashreq Platinum Business Credit Card does not have any minimum spend thresholds. This means your Business will start earning 1.25% cash back from as little as AED 1/-. In addition, when the Card member(s) spend at our Partner Outlets the Company will enjoy the specific discounts. So your Company is saving and earning at the same time. Q. Is the cash back earned tiered based on the purchase amount? A. No. Cash back earned on the Mashreq Platinum Business Credit Card is not based on purchase amounts. You can get cash back of up to 1.25% on local purchases and 2.5% on international purchases. Unlike other Business Credit Cards in the market, your Company does not have to wait till you reach minimum spend threshold before your Company start earning the cash back. Your Company earns cash back from the very first dirham that the card member(s) spend. Q. What happens to the cash back earned in the case of a reversal? A. In the case of a reversal of a transaction, the cash back earned for that transaction will also be reversed. Cash back will be awarded to only actual purchase transactions. 4 Q. 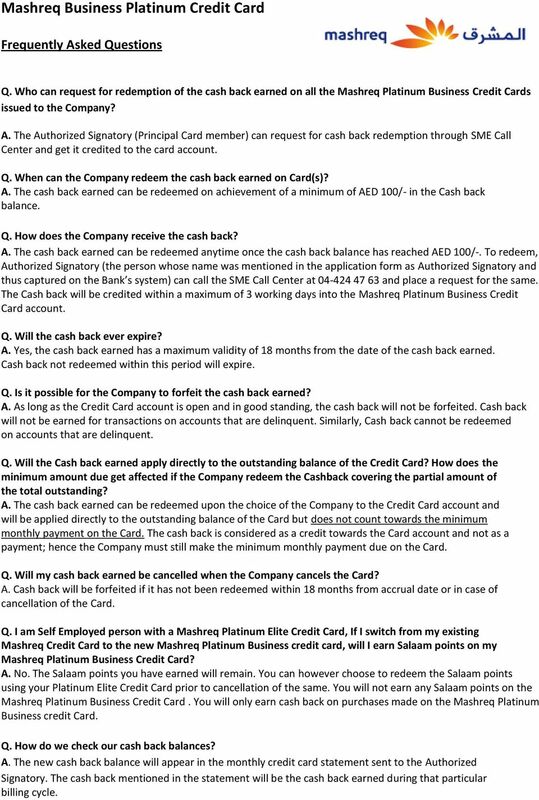 Who can request for redemption of the cash back earned on all the Mashreq Platinum Business Credit Cards issued to the Company? A. The Authorized Signatory (Principal Card member) can request for cash back redemption through SME Call Center and get it credited to the card account. Q. When can the Company redeem the cash back earned on Card(s)? A. The cash back earned can be redeemed on achievement of a minimum of AED 100/- in the Cash back balance. Q. How does the Company receive the cash back? A. The cash back earned can be redeemed anytime once the cash back balance has reached AED 100/-. To redeem, Authorized Signatory (the person whose name was mentioned in the application form as Authorized Signatory and thus captured on the Bank s system) can call the SME Call Center at and place a request for the same. The Cash back will be credited within a maximum of 3 working days into the Mashreq Platinum Business Credit Card account. Q. Will the cash back ever expire? A. Yes, the cash back earned has a maximum validity of 18 months from the date of the cash back earned. Cash back not redeemed within this period will expire. Q. Is it possible for the Company to forfeit the cash back earned? A. As long as the Credit Card account is open and in good standing, the cash back will not be forfeited. Cash back will not be earned for transactions on accounts that are delinquent. Similarly, Cash back cannot be redeemed on accounts that are delinquent. Q. Will the Cash back earned apply directly to the outstanding balance of the Credit Card? How does the minimum amount due get affected if the Company redeem the Cashback covering the partial amount of the total outstanding? A. The cash back earned can be redeemed upon the choice of the Company to the Credit Card account and will be applied directly to the outstanding balance of the Card but does not count towards the minimum monthly payment on the Card. The cash back is considered as a credit towards the Card account and not as a payment; hence the Company must still make the minimum monthly payment due on the Card. Q. Will my cash back earned be cancelled when the Company cancels the Card? A. Cash back will be forfeited if it has not been redeemed within 18 months from accrual date or in case of cancellation of the Card. Q. I am Self Employed person with a Mashreq Platinum Elite Credit Card, If I switch from my existing Mashreq Credit Card to the new Mashreq Platinum Business credit card, will I earn Salaam points on my Mashreq Platinum Business Credit Card? A. No. The Salaam points you have earned will remain. You can however choose to redeem the Salaam points using your Platinum Elite Credit Card prior to cancellation of the same. You will not earn any Salaam points on the Mashreq Platinum Business Credit Card. You will only earn cash back on purchases made on the Mashreq Platinum Business credit Card. Q. How do we check our cash back balances? A. The new cash back balance will appear in the monthly credit card statement sent to the Authorized Signatory. The cash back mentioned in the statement will be the cash back earned during that particular billing cycle. Terms and Conditions for HSBC Rewards Programme (April 2015 Edition) 1. HSBC Bank Malaysia Berhad (Company No. 127776 V) will be referred to as HSBC. Card Eligibility: To be eligible for an Account, you must meet certain minimum income, residency, age, credit quality and other requirements. ANZ CashBack programme guide CashBack rewards you for purchases you make with your CashBack card. Using your card CashBack Rewards CashBack rewards you for purchases you make with your CashBack card. Maybank 2 Cards Reserve American Express Card Privilege Booklet. Humanising Financial Services Across Asia. How We Will Calculate Your Balance: We use a method called Average Daily Balance (including Current Transactions). Open a Pelican Visa Credit Card today & earn DOUBLE POINTS on balance transfers! * The more you transfer, the bigger the awards. earn up to 30,000 points per month minimum transfer of only $100 Apply Now! We, Us and Our means Citibank Berhad (297089-M) its successors-in-title or assigns. Copyright 2015 Mobilink Business. All rights reserved. Credit Card Rewards. Earn points toward dream vacations, merchandise, gift cards, cash back and more. Start earning your rewards today! Get the double power of cashback and reward points on fuel purchases.